In 2008, I fell in love with a book and that same year I was lucky enough to meet the author at a book signing event here in Orlando (and only the second author that I had met at that time). 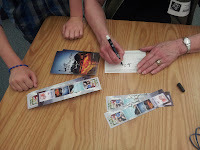 At the signing event, myself and a handful of students were in awe of the presentation and after, during the signing, I asked the author if she would be willing to do a phone interview with my students after we read the book later in the year and she graciously agreed. This was the beginning of my Hurt Go Happy unit that ends with my students being able to talk to the author, Ginny Rorby, on the phone and it was also the beginning of a friendship that I cherish. Earlier this school year, I was contacted by Ginny and she asked if she could stop by my school when she was in Florida. Um, YES! I didn't even hesitate (and I was so glad it worked out this time, because last time she offered it was during midterms and I had to say no). The date seemed so far away when we set it, but it finally came this Monday. Now, Ginny had a bit of a task before her because half of the students attending were students who I had last year that had read Hurt Go Happy and the other half will not read it until later this year. I was intrigued to see what she decided to focus on in her presentation and she did not let down. 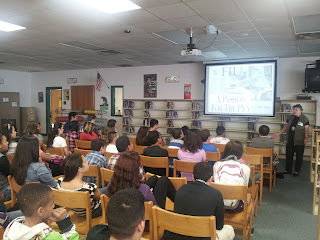 Myself and 60+ students joined together to watch Ginny's presentation in the media center. First, Ginny told a bit about her life which was a great starting point for my students because Ginny had a school-life that my intensive reading students really connected to- she struggled and did not feel very successful in school. However, she found that with the right teacher and with the right inspiration, she was able to find a career that she loves and is good at. Much of her inspiration was from her own life and from animals and she shared with us many stories that inspired her as well as some of the things she really believes in such as protecting our children and our animals. 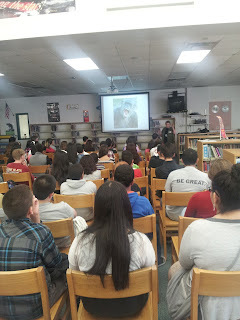 Throughout all of this, she also talked about her books in a way that would intrigued students who had or had not read her books. Finally, she talked about the books she is working on now and gave my students advice- "Read. And write." Such simple but important advice. To end the day, Ginny met each of the students one-on-one and signed post cards and bookmarks for each of them and took pictures with anyone who wanted one. 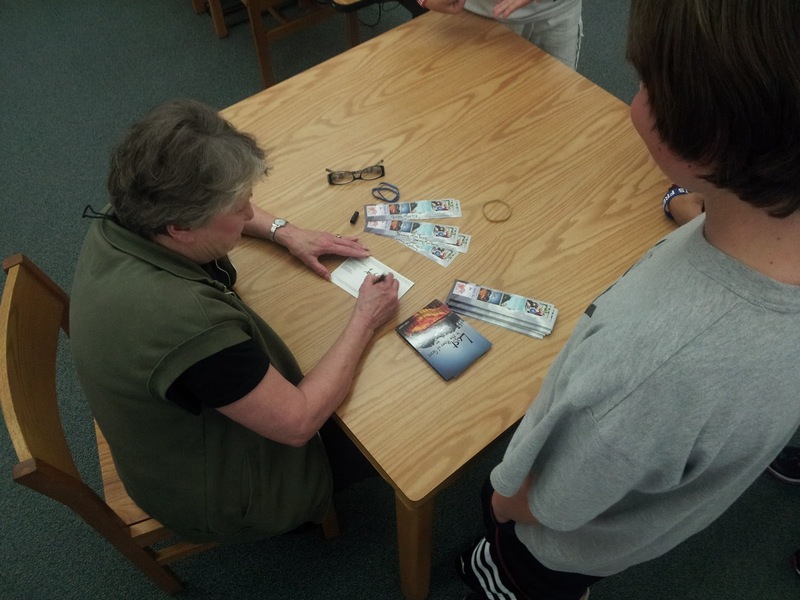 For many of my students this was the first author they had ever met and you could see the excitement as they talked to her. It made me tear up just seeing them be this excited about an author. When we returned to our classroom, Lost in the River of Grass, her newest book, flew off the shelves.
" She told us that she was a horrible writer, but she kept trying. Ginny Rorby inspired me to read her books and that reading is amazing. I now want to write books." J.M. "Ginny is really nice and funny. She got bad grades like me and she is an inspiring person." M.L. "The thing I won't forget is actually meeting her. I was really excited for today. I have never met an author in my whole life. She is really nice and she looks creative. It was sad when she left. Only if she could have stayed longer, but she couldn't." M.H. "I got good advice about writing and I was really happy about it." D.E. "Best Time Ever :)" E.R. "Her story changed the way I think about writing. Mrs. Ginny really changed my focus in life." C.M. "This was the 1st author I have ever met. It's nice to know authors are regular people that look at life the same way as you. I'm so glad I met Ginny." K.K. "Her books are an inspiration to me. Also I love how she likes animals and is against their abuse." P.S. "Amazing how she never gave up! Just listening to her tell about a teacher who was special to her was amazing. She's really amazing. She's such a great author and person. Today was great and I appreciate it. The first time meeting an author is something amazing." A.G.
"It was a once in a lifetime opportunity to meet such a phenomenal author like Ginny." D.L. "Having Ginny at the school was interesting. It was life changing. She is successful even though she never did very good in school. She never gave up. And to think it started with an article of a dog that has been abused and abandoned. It makes me not want to give up." B.R. "When I listen to you about life that kinda relates to my life as a bad kid, but still try my best and work hard for you. I love how you care about animals and try to care for them or protect them Also, you're such a funny, kind, beautiful, nice, sweet author." R.J.
"I know if I try my best, I can do better in school. It's hard, but the things you learn and live for make it fun." J.N. "I learn that if we pay attention in school, we can do well in the future." S.G.
"You are a very impressive woman and I think you inspired lots of people. I think people now will start actually thinking about things." Y.G. "I learned that even if I'm not good at something, just don't give up." M.O. "I really liked how much you like animals and how you explained how you can be worse in life but maybe in the future you can become an amazing, intelligent person." J.M. And all throughout- gushing about how cool she was, how much they want to read her books or loved her books, and lots of thanks for coming and being the first author they ever met. Reading these notes and letters after the visit made it all come together for me; I loved having Ginny visit, but I cherish how important and exciting it was for my students.